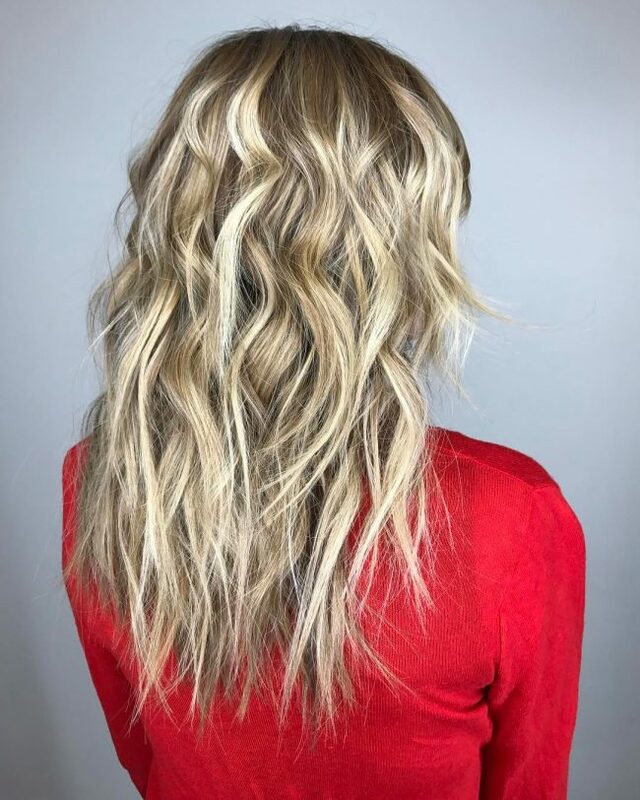 The execution of blonde balayage on the dark cherry brown color and the nicely done curls will have everyone drooling. The hairstyle features a dark color on the roots that extends all the way to the crown before transitioning into a blonde color instantly. Use a medium sized barrel to style the hair into tight beach waves that begin from the point where the balayage starts. The blonde finish on these thin strands of hair diverts all the attention to the hair color. 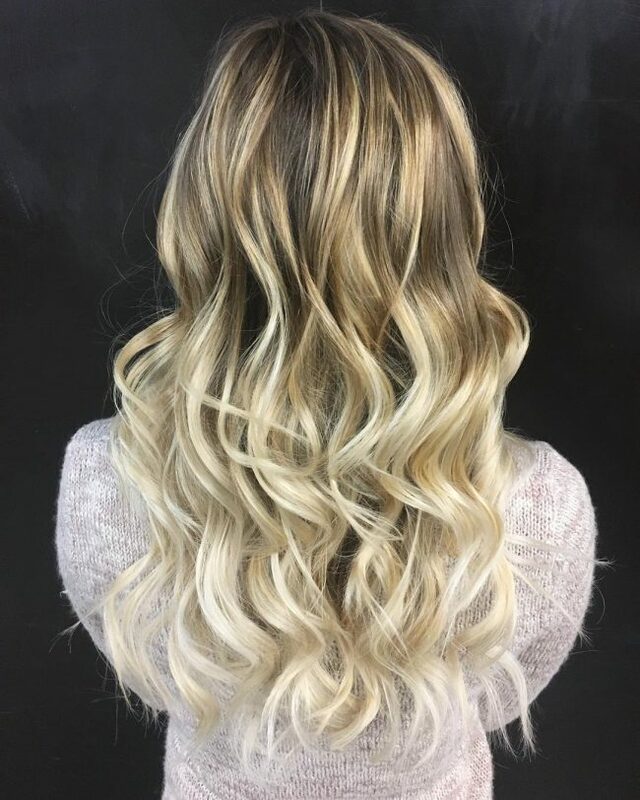 The dark brown hair roots that transition into a blonde color complement the warm skin tone while the side parted finish adds more volume to the fine hair. Give the part to the hair depending on the shape of your face and the impression you want to create. 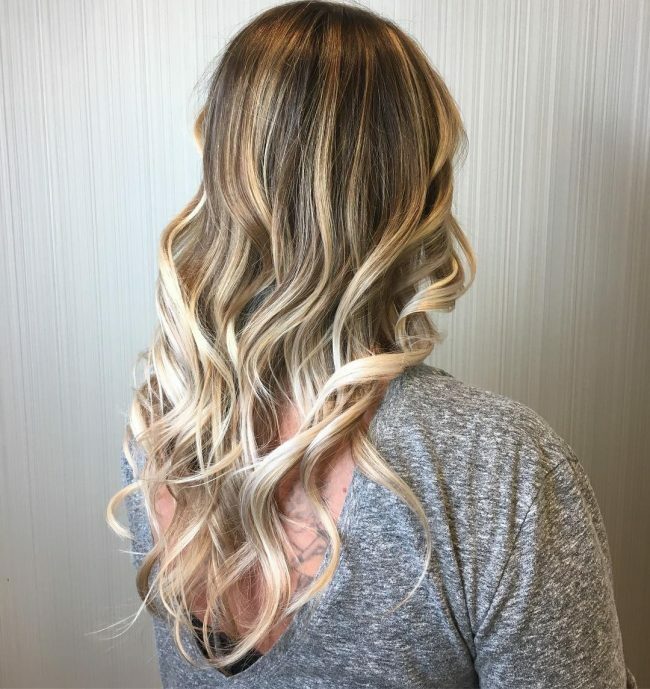 The hairstyle features a dark chocolate brown root that slowly transitions into a golden blonde color that begins a few inches from the roots before adopting a lighter shade of summer blonde from mid-length to the ends. 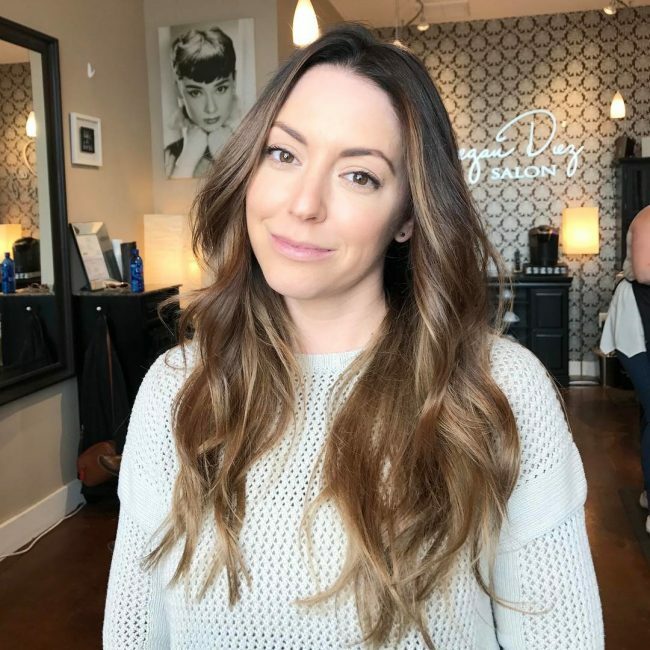 The cute beach waves on the hair that face different directions add a subtle visual volume to the hair while giving a pop to the rich feminine colors. Spritz a shine spray on the hair to maintain its general sheen. Are you looking for a hair color that will perfectly match your neutral skin tone? Then this is the hair color for you. 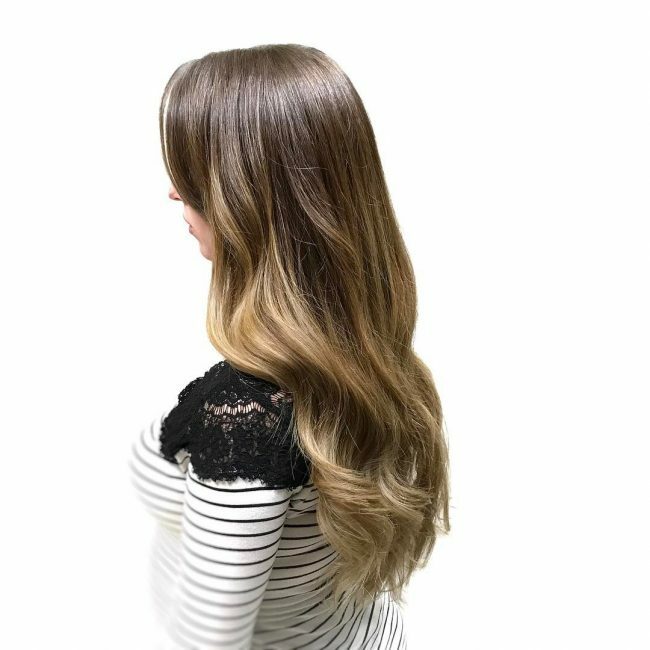 The ash brown color takes the roots and extends down to the nape of the neck where they combine with the beige blonde highlights that begin at the crown and adopt a full balayage at mid-length. Style it into loose beach waves from the point where the brown color fades flaunt the multidimensional look on the hair. 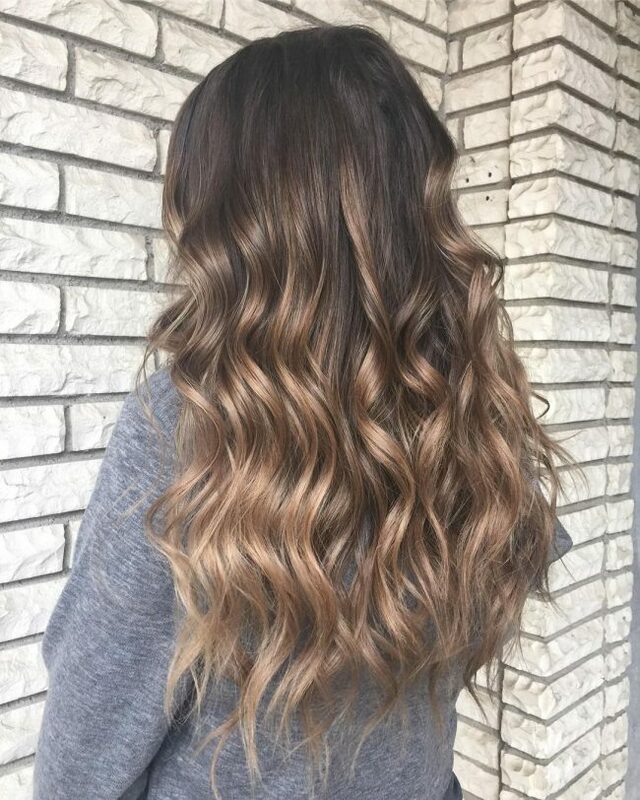 The sun-kissed hair consists of natural dark brown free-hand highlights that take the better part of the back combined with a dark chocolate brown hair at the front parts of the heads and the ends. Give the thick mane a middle part before styling it straight and giving the ends an angled layered finish. 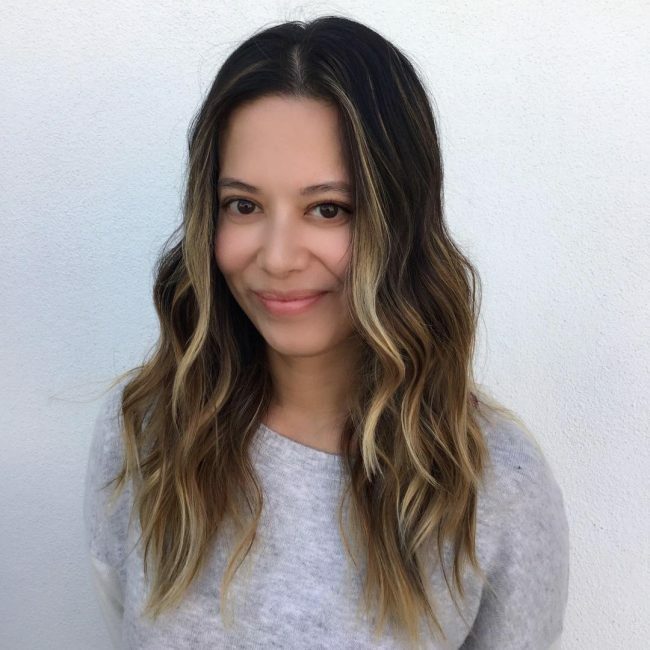 Brown hair colors that assume a blonde balayage accentuate the warm skin complexion of this beautiful woman. 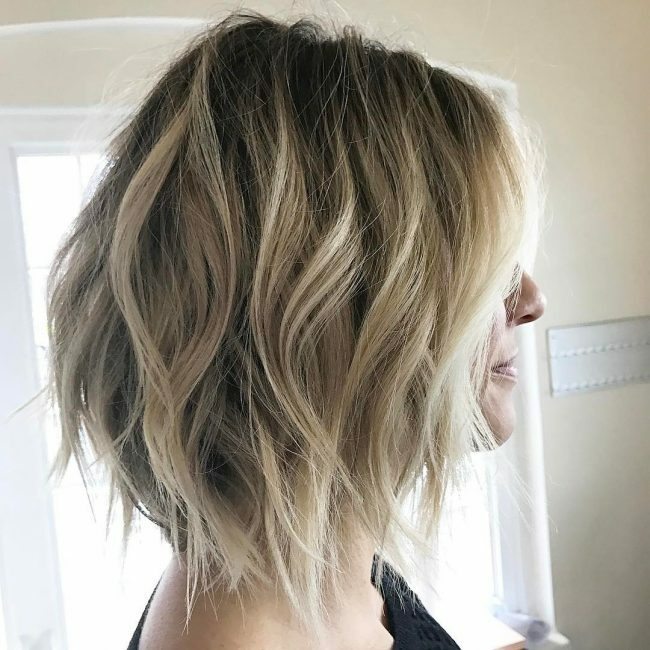 The beach waves on the hair that begin at the nape of the neck allow the upper part of the hair to hug the face perfectly while the swirl just above the neck gives a pop to the woman’s square jaw. Give the hair a center part that gives the two colors a natural flow. 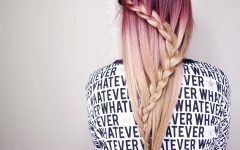 The hair color is a conglomerate of three colors that complement each other in a magical way. 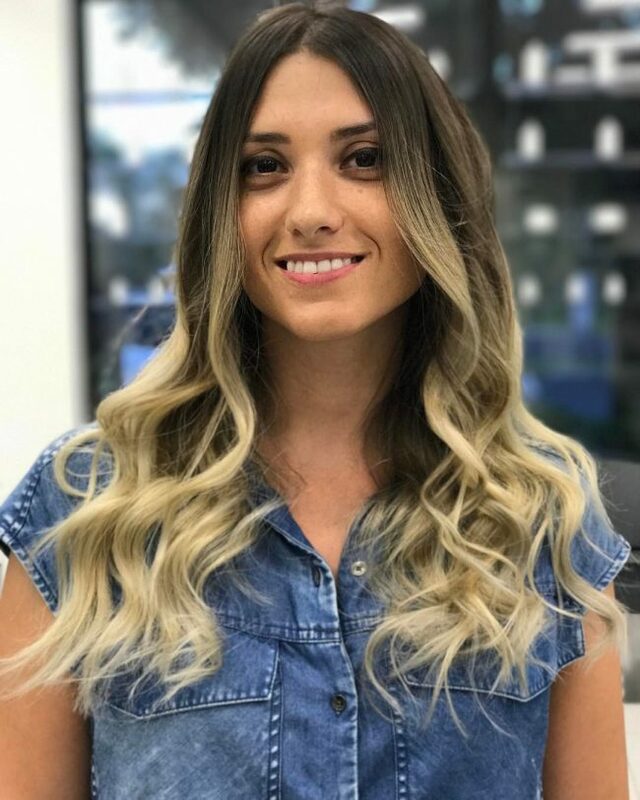 The combination of both warm and light colors makes it ideal for all skin complexions while the loose beach waves that take the chrome wave’s ensemble highlights the color transition. 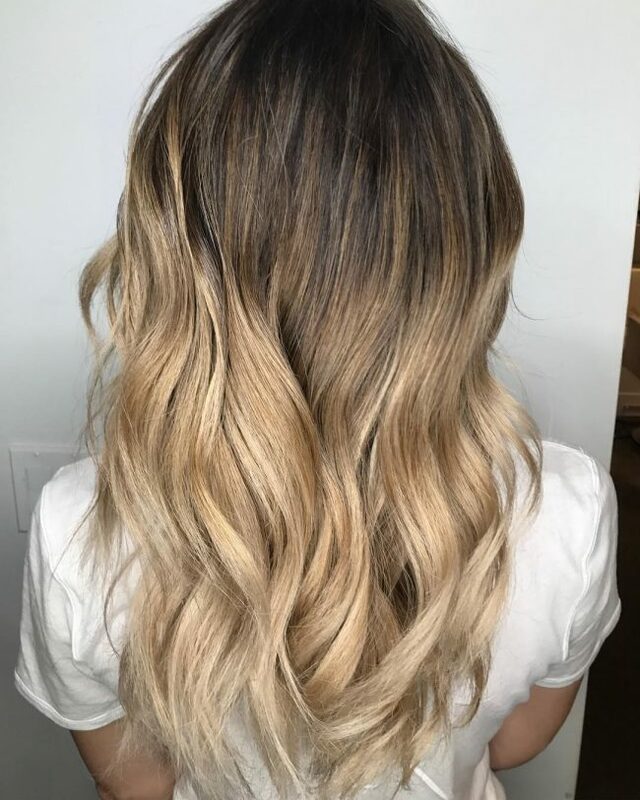 The hair roots assume a faded brown root that transition gradually into a blonde-brown mix before taking in a bright ashy blonde color on the ends. This is the color combination for anyone who does not want to go bold with a silver hair color. 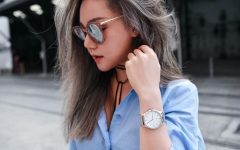 The hair color features an ash-brown color that takes the roots and extends down to the crown where it assumes a silver blonde hair color. 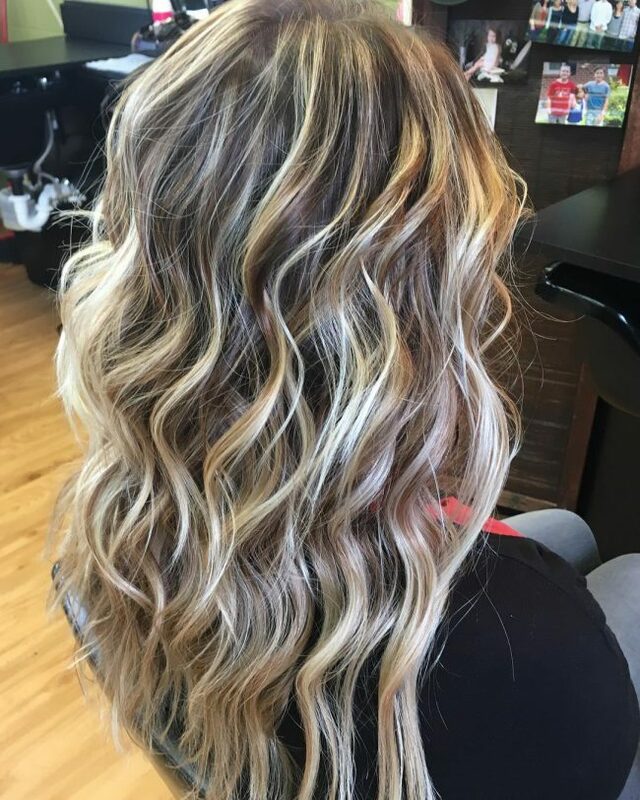 Include some thick S-shaped waves to highlight the balayage. The hair color will earn you long breaks before visiting your stylist. 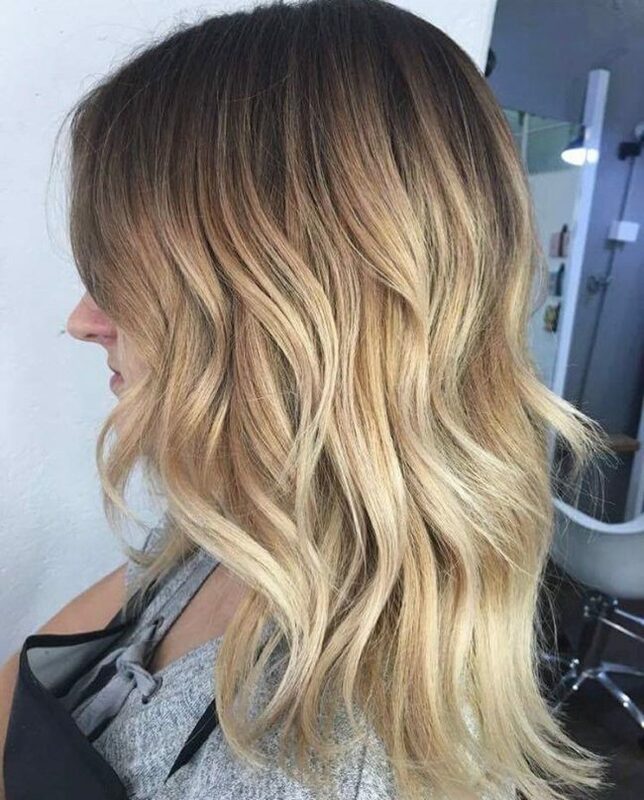 The blend of brown and honey blonde color provides a perfect balance between the light brown and the dark blonde hair color. The warm and shiny hair color falls perfectly on medium skin tones while the hair surrounding the face has a lighter shade that gives a glow to the face. Prep the hair by adding a volumizing mousse to the hair to add more texture and volume to the hair before styling it into loose beach waves from mid-length. A caramel ombre gives the hair some taste, depth, and texture to your hairstyle. The brown hair color begins from the roots and melts gradually into a caramel color. Go slow on the waves on the hair to give a laid-back effect on the hair and display the beautiful color transitions. 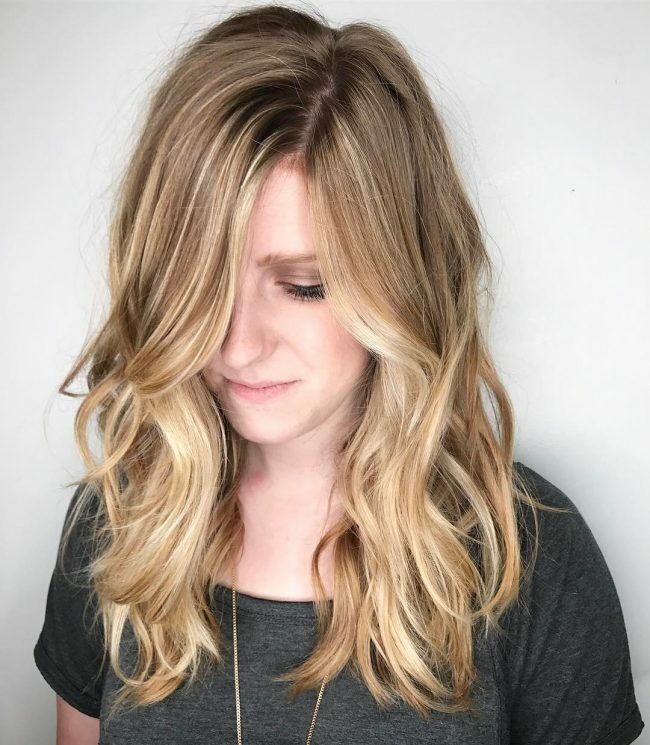 The heavy cool blonde highlighting on medium brown natural color gives the hairstyle a stylish appeal while the length of the hair makes it easy to manage. 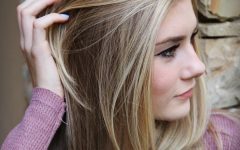 The brown hair is quite common and dull, but a blonde color livens it. This hairstyle is perfect for both formal and casual occasions. 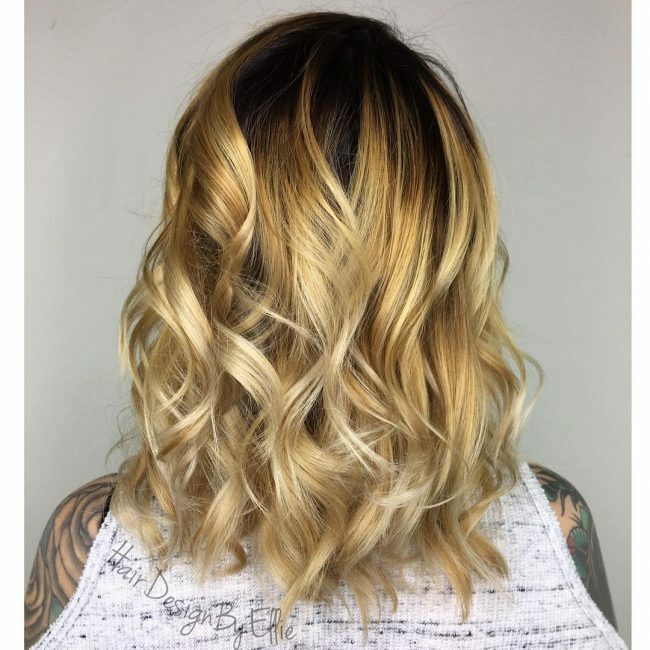 The color falls perfectly on anyone who does not want to go overly bold with lighter blonde colors. 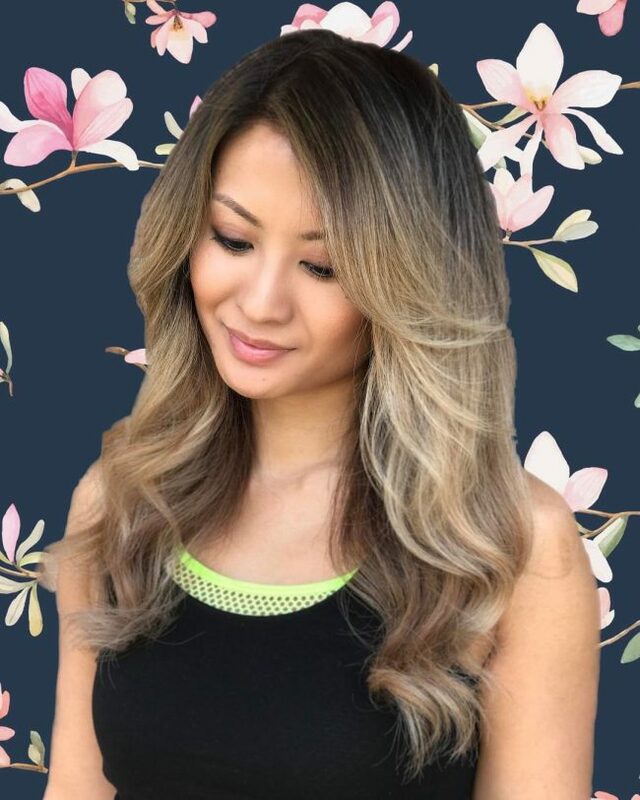 The soft execution of dark brown-blonde balayage on black hair brings out the feminine perfection on this woman while the warm color complements her cool skin complexion. Give the hair a center part to give some dimension and volume to the hair before styling it into loose barrel waves. Using lots of texturing cream is the secret behind this kind of hairstyle. The style features a dark brown base that transitions into a natural blonde color from mid-length. The blonde color increases its intensity as it approaches the ends. 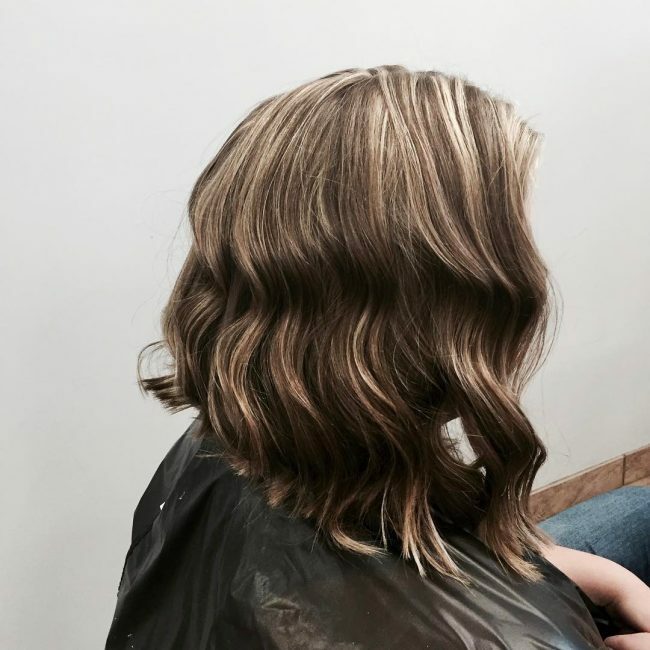 The beautiful S-shaped waves on the hair begin at the point where we have the balayage and taper off as they approach the ends. Fine hair is a bit tricky to style, but the subtle outcome on this hair is a clear indication that one can achieve any look with the hair. 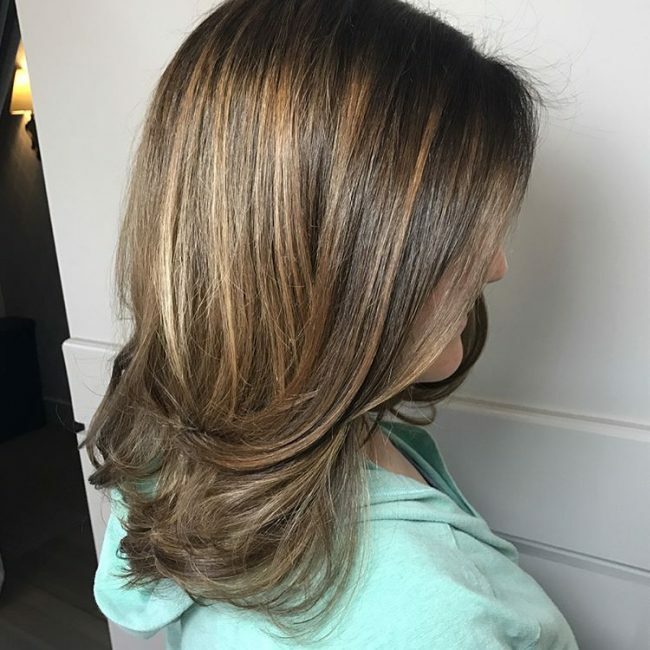 The blonde highlights on brown hair colors fall naturally on the neutral skin tone while the angled layers with razored ends give a collected look on the person wearing the style. The middle part of the hair and a slight tease of the front section gives volume to the thin straight hair. 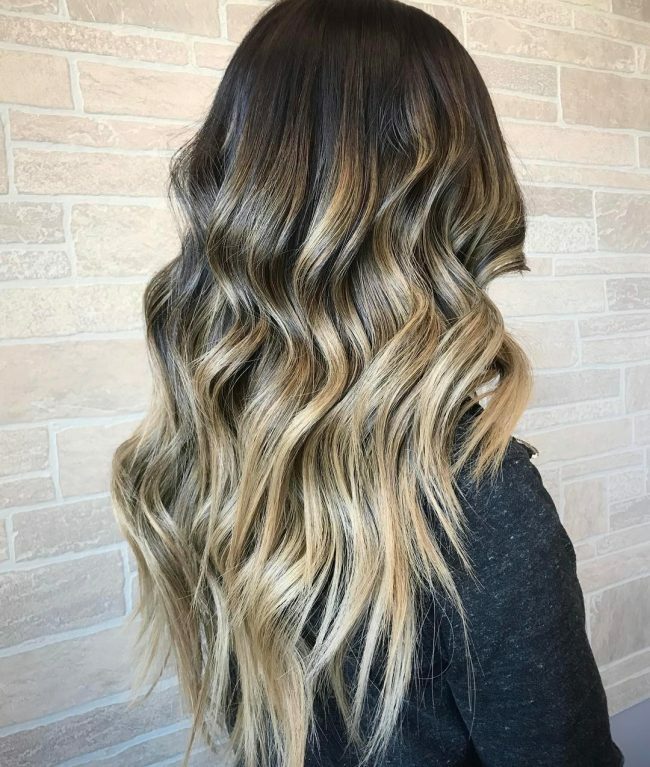 Blonde hair has always been an all time favorite for most people, but a blend of brown breaks the monochromatic look that comes with a single color. Prep the hair by adding mousse to the damp hair to improve the texture and then style it into beach waves that give a tousled finish. Run your fingers or a wide-toothed comb on the hair to retain the messy look on the hair. The combination of two vibrant colors on the hair complements the warm skin complexion and hazel eyes beautifully. The dark brown runs from the roots to the mid-length where it combines with the honey blonde color to form a striped look on the hair. 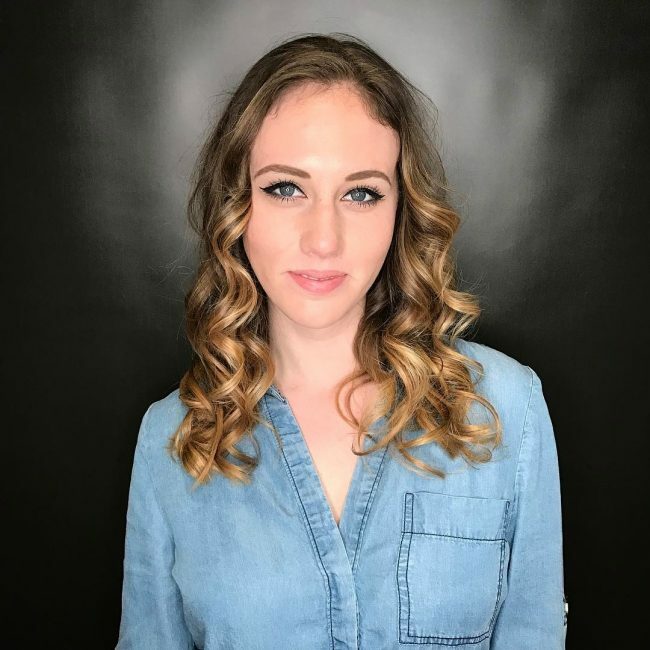 Wrap medium sections of the hair around a curling wand and then use a flat iron to style the hair into beautiful barrel curls that run from mid-length to the ends. The small strips of hair that are colored differently will have everyone admiring the artsy used in coming up with the hairstyle. 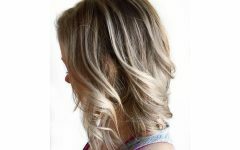 The hair is a combination of chocolate brown lowlights, light ash blonde highlights, and subtle streaks of honey blonde. The three colors blend in together in a fun way, but the ash-blonde color seems to have overpowered the others. The hair color may take a longer time to accomplish, but the outcome is nothing short of amazing. This is a perfect hair color for anyone who wants to have a different look on the hair while at the same time maintaining a natural hair effect. 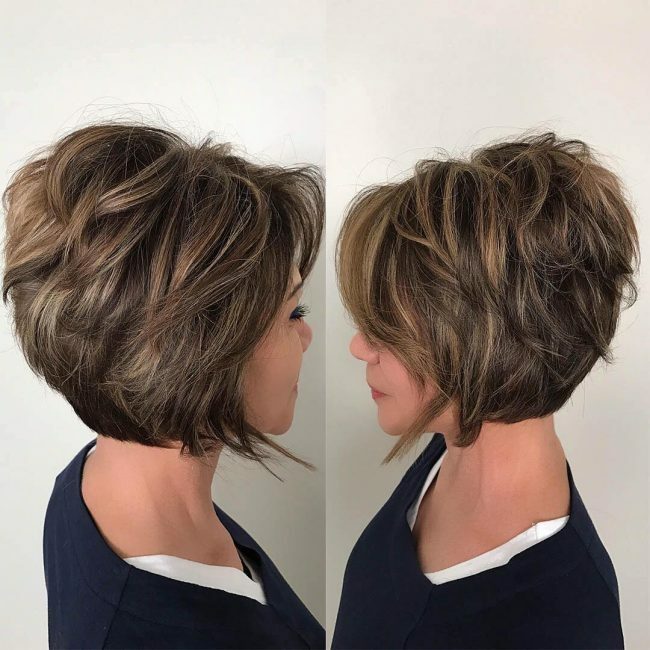 The style features a dark chocolate brown color that takes the subtle copper blonde color at the crown area, which increases in intensity as it extends to the ends. The straight look on the hair allows the color to fall naturally while the side part gives it depth and texture. The combination of dark chocolate brown color with a deep caramel blonde looks good on all skin complexion, but it falls nicely on the medium to dark skin tones. Blend the caramel- blonde color with a dark colored base to keep the hair look as natural as possible. Allow the tight beach waves to cascade down naturally flaunting your dark hair balayage in style. Messy hair has been the latest hair trend in the last few years. The hair features a light brown color from the roots running up to the crown area. The silver blonde highlights begin at the crown area extending all the way to the ends. The messy waves allow a natural alternation of the brown and the silver color. Add some texturing cream on the hair before styling it to improve its texture. The soft execution of the blonde color on the dark brown gives you an elegant and glam look all day. 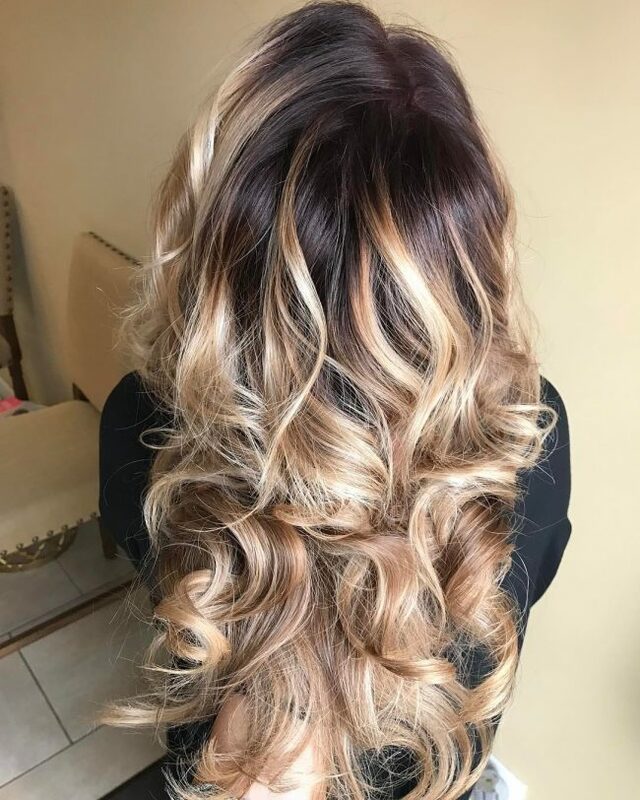 The hair has a dark blonde color on the roots that transition into a natural blonde color from the crown area, which then fades as it extends towards the ends. Style the hair into subtle waves to give it some dimension and depth. 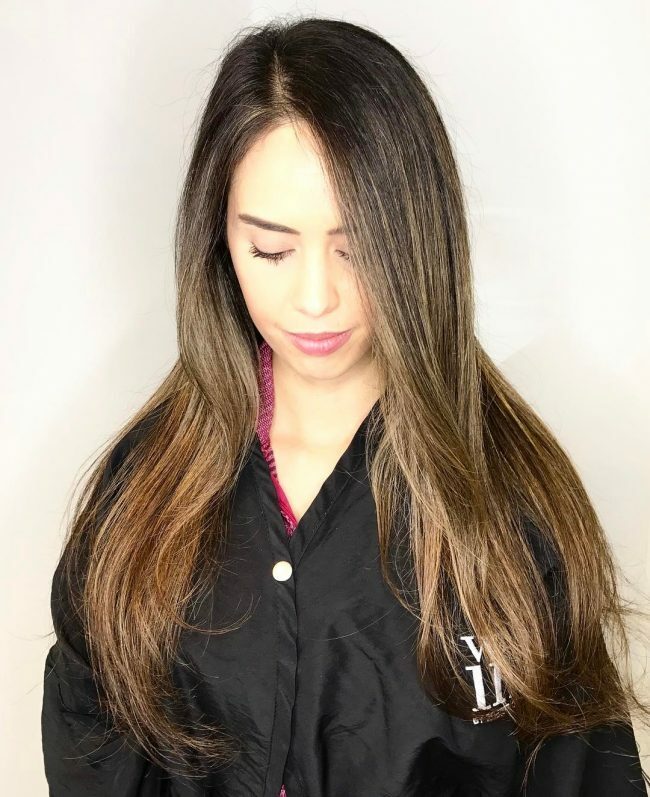 The blonde highlights blend perfectly with the black hair with a dark brown balayage bringing out the soft femininity glory on anyone with long or medium length hair. The center part of the hair gives it some volume while the face framing highlights complement the warm skin tone. Use a curling wand and a flat iron to style the hair into loose waves that begin from mid length extending all the way to the ends. The immaculate blend of the blonde color with different shades of brown will catch everyone’s attention wherever you go. The side swept part at the front allows the thick mane to flow naturally without overwhelming the face. The hair has a dark brown shade at the roots that transition into a lighter bronde color as it flows down the ends. The blonde free-hand balayage breaks the monochromatic effect of the brown color and add some brightness to the hair. A blonde color will always be the perfect go-to hair color for anyone looking for a drastic change in brown hair. 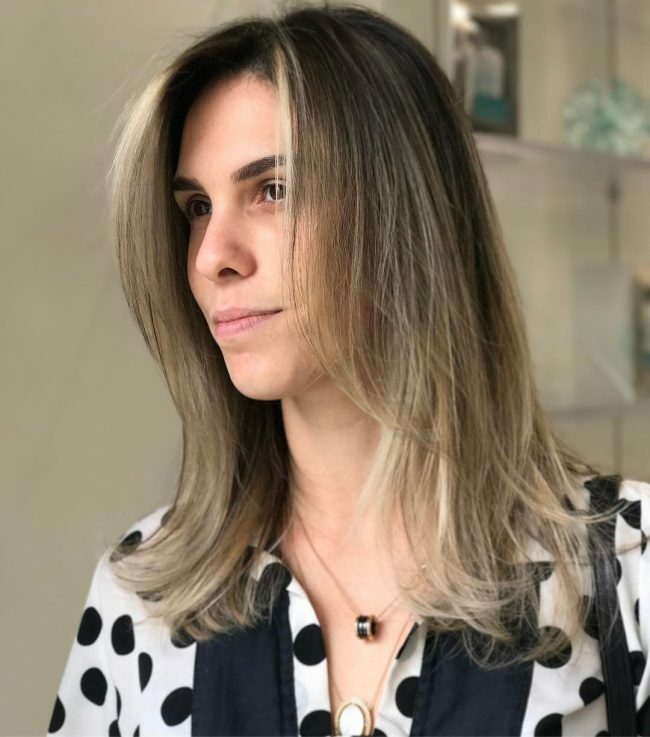 The easy maintenance hair color allows you to enjoy the best of the brunette and the blonde world without having to visit the stylist frequently. The hair color is ideal for the warm skin complexions although anyone with a cool tone can opt for a lightened blonde color. Style the hair into beautiful beach waves, and you are ready to go. 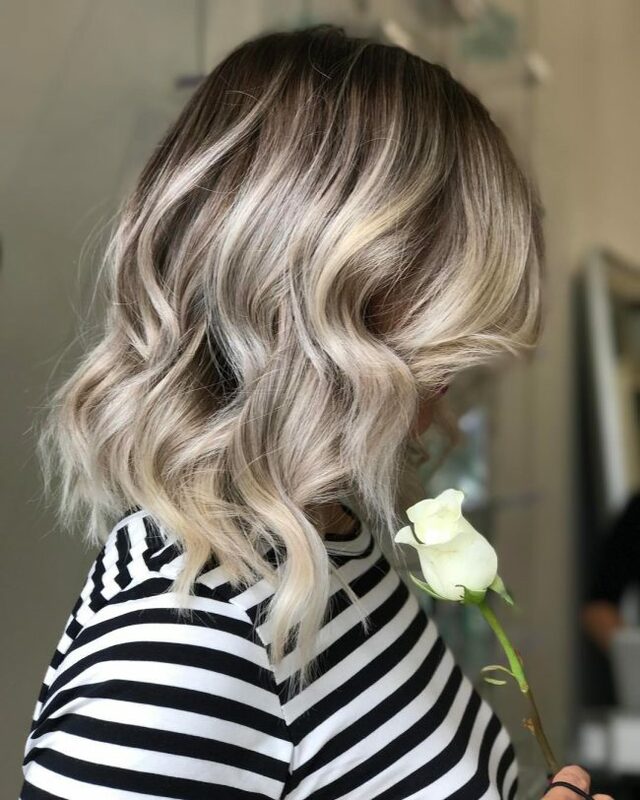 Getting blonde highlights that are close to your brown color is a sure way of getting a shimmery natural glow on your pixie. Spread the color on the top wavy parts of the hair to give a contrast to the brown undercuts. The side swept bang has a full balayage that allow the one to flaunt her brown skin complexion. It is evident that blonde highlights on brown hair are the color to go for this year if you are looking for a soft and feminine outcome. You can combine a dark brown with a lighter blonde shade for a contrasting look. You either can allow the two colors to complement each other by using two lighter shades or two dark shades. Trt out different blonde and brown combinations to identify the best color for you.